The Land Report Collective deals with landscape in fundamental ways and as a foundational reference point. Bajuyo’s work is fueled by compassion and a critique of capitalism, as she explores perceptions of value in order to foster an awareness of the role of social amnesia on consumer behavior. Brown considers the politics of mountaintop removal in his construction of objects and installations while also creating playful formal assemblages. Jobe typically creates schemes for public interaction through the delineation of pathways or through site-specific focal points. Jones responds to desert environments with experimental interactions, model scale sculpture, and large scale outdoor works. Kikut incorporates a lifelong interest in the horizon line in a series of paintings with flat Midwestern landscapes as his muse. 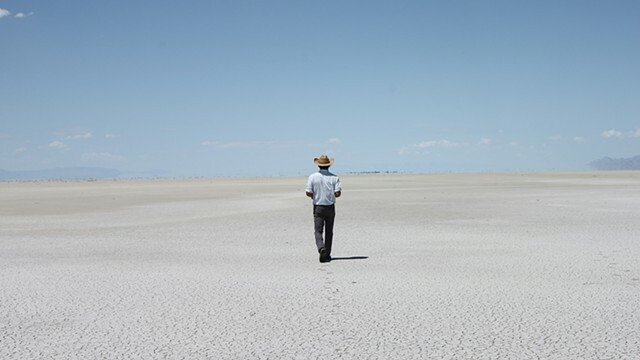 Shadwell views the landscape from a non-traditional lens, responding to ephemeral images from highway road cameras, monumental mining operations and the optical nature of the salt flats through drawing, sculpture and video installation.